That's how many times I've visited Château de Chambord in the nearly six years since we've lived in the area... and I've never gotten sick of it. When you emerge from the Chambord Forest and see the clearing where the giant castle sits, it almost looks painted on the sky. We always stop before we park and take photos at this point because even from this far back, it's hard to get the whole structure in the shot. Construction on Chambord began nearly 500 years ago, on September 6, 1519, and was never completed. Some have suggested that Leonardo da Vinci may have designed Chambord, especially the double helix staircase in the middle of the building. King Francis spent less than seven weeks here total, and when he died, the castle remained unused for nearly a century. Among those who lived there at times were the Duke of Orléans and King Louis the 14th, who finished the royal apartments and added a 1,200-horse stable. In 1939, shortly before World War II brokeout, some art collections from the Louvre and Compiègne museums (such as the Mona Lisa and Venus de Milo) were stored at Chambord. Recently, there was a temporary exhibit about the efforts to maintain France's national art collection during the war. If you go, bring your walking shoes. 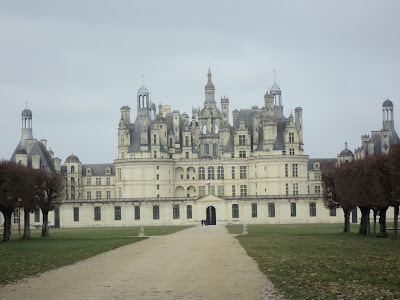 Chambord's got 440 rooms, 365 fireplaces, and 84 staircases. I enjoy going to the highest point allowed and looking out at the view of the Cosson River. But boy, do your legs ache afterwards! According to a Disney animator, Chambord was the inspiration for the beast's castle in Beauty and the Beast. I must say I am captivated by it each time I visit, and am looking forward to at least 18 more trips!